If there is one thing to be learned from In Fear, it is always check out the reviews of a hotel before booking a room. The British import is a case study in how to bring a tense, atmospheric horror thriller to film in a good way. And in a genre that is filled with loads of movies lacking originality and a complete absence of any tension or even the development of tension, it is a welcome addition. Most of the entire first half of the movie is a slow burn to the back half that turns into a question of how scared does one person have to be to turn to violence? Lucy (Alice Englert) and Sam (Marvel’s Agents of Shield’s Iain de Caestecker) are going to a festival and Sam makes the pre-emptive move of booking a hotel room for the night for obvious reasons. Driving to the hotel, the not-really-a-couple follow the well-placed signs along the road but soon discover that something is amiss. The signs keep them going around in circles forcing them to make difficult driving decisions that unfortunately pushes them deeper into the backwoods of England. Being lost is one thing. Being lost and then having someone start f**king with you is a complete other matter. Soon, Lucy and Sam have their car alarm going off for no reason, their clothes stolen and then scattered across the road, hair getting pulled in a weird way, 50 foot trees falling for no reason and more. All the while, a not-so-friendly Landrover continues to pass by. After they begin to turn on each other, they accidently hit a bystander in the middle of one of the backroads and he gets in their car claiming to be having similar issues with someone stalking him for no reason. But something just isn’t right with Max (Allen Leech) and you can tell right from the start that he’s not all there – and it isn’t because he’s got a nasty cut in the head. Max tells the story about a myth involving the area about a young boy that would stand in the middle of the road and force cars to crash and then tormenting the passengers to find out how far they would go after being scared out of their minds. No spoilers beyond what happens after they meet Max but you can probably figure it out but In Fear doesn’t hide this at all but smartly uses his smarmy personality to its advantage to continue the torment and abuse these poor people. 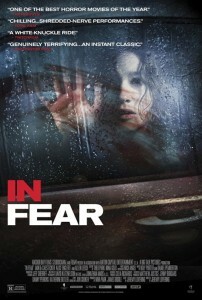 If you are looking for a high body count, super gorefest, In Fear is not the movie for you. But if you have been missing out on a very tense, extremely moody horror thriller, this is definitely one to check out.